Toronto, Ontario--(Newsfile Corp. - November 29, 2018) - Aurania Resources Ltd. (TSXV: ARU) (OTCQB: AUIAF) (FSE: 20Q) ("Aurania" or the "Company") reports that its exploration teams have discovered silver-lead-zinc mineralization in grab samples that run as high as 325 g/t silver, 48% zinc, and 39% lead, discovered between the new Tiria epithermal gold-silver target and the Jempe copper porphyry zone in its Lost Cities - Cutucu Project ("Project") in Ecuador. Aurania's Chairman and CEO, Dr. Keith Barron commented, "A few days ago, we announced that we are seeing evidence of a gold-silver epithermal target being linked with a copper porphyry in the Kirus-Tinchi mineralized system (see Aurania's press release dated November 27, 2018). 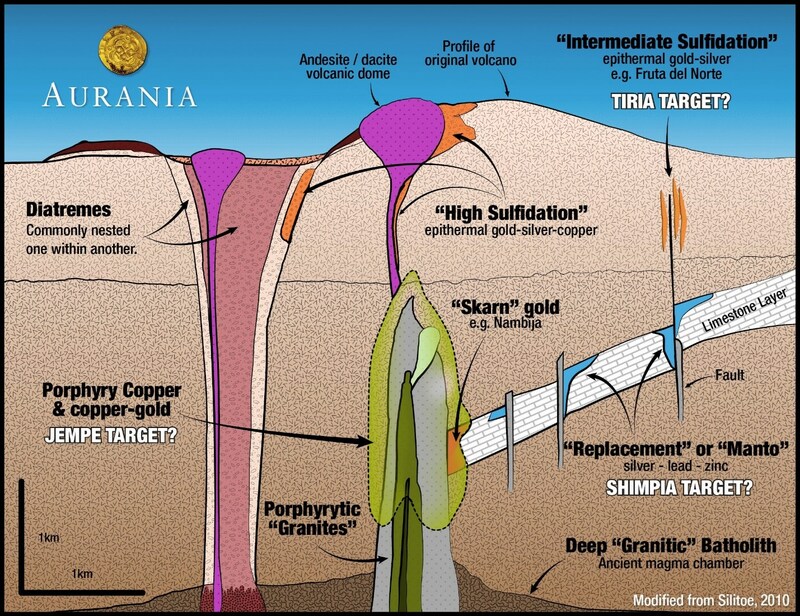 We are now seeing evidence of a second complete mineralized system that has the Jempe copper porphyry at its core, which evolves outwards through a silver-zinc-lead zone (Shimpia target) and finally into the Tiria epithermal targets for gold-silver at the furthest extremity of the system. Having these indicators of an entire mineralized systems within our Project will allow us to develop each target efficiently and turbocharges our definition of value in the Project. Our focus remains on gold. However, we feel it is in the best interest of all our stakeholders to responsibly pursue these additional emerging opportunities in copper - the electric metal - and other commodities that can add value to the Project at minimal extra cost to Aurania." When prompted, webcast participants enter: First Name, Last Name, Company, Email Address. Callers should dial in 5 - 10 min prior to the scheduled start time and ask to join Aurania's conference call. Stream sediment sampling has identified silver, zinc and lead enrichment over an area measuring 8 kilometres ("km") by 4km at Shimpia (Figure 1). Grab samples of rock collected by the reconnaissance exploration teams contained up to 325 grams per tonne ("g/t") of silver, 39% lead and 48% zinc within the target area (Table 1). The grab samples contain semi-massive sphalerite (zinc sulphide mineral) and galena (lead sulphide) with abundant barite (barium sulphate) within limestone host-rock. The silver is not identifiable to the naked eye, but is suspected to occur within the galena. Shimpia lies within a fault-bounded area that is linked with the conspicuous magnetic zone evident in the geophysical data at Jempe. Grab samples of rock from reconnaissance at Jempe returned a maximum value of 3% copper and 47g/t silver. The copper is contained in the minerals malachite, chrysocolla, tenorite, chalcocite and cuprite. Table 1: Selected analytical results for grab samples of rocks from the Shimpia target. Initial exploration has identified two areas adjacent to Shimpia in which streams contain concentrations of pathfinder elements typical of epithermal gold-silver mineralization including arsenic, antimony, selenium, thallium and molybdenum (Figure 1). There are two areas of enrichment of these elements at Tiria. Tiria East covers an area of 7km by 2km in extent and Tiria West, 4km by 2km. A conceptual link between these targets is illustrated in a schematic cross section through an ancient volcano shown in Figure 2. Further exploration will focus on the structural corridor that links the mineralized areas within the Jempe - Shimpia - Tiria system. Apart from completion of the stream sediment sampling program in the area, ridge and spur soil sampling will commence to refine the location and shape of the specific targets in preparation for scout drilling in 2019. Permitting for the initial drilling is expected shortly, contract terms have been finalized and a drill will be mobilized to the property as soon as the final permit has been received. The hold-up is with the environmental ministry - the permit cannot be processed until the new Minister of the Environment has been appointed. Notwithstanding these additional discoveries, the Crunchy Hill epithermal gold target, located less than one kilometre from a paved road, remains the Company's initial scout drilling target. Figure 2. Schematic vertical profile through a mineralized system related to volcanism showing a porphyry at the core and its relationship to "replacement lead-zinc-silver" and epithermal gold-silver mineralization. The conceptual location of the Jempe porphyry, Shimpia "replacement", and Tiria epithermal targets are also shown. The samples were prepared for analysis at ALS Global's ("ALS") lab in Quito, Ecuador. The rock samples were jaw-crushed to 10 mesh (crushed material passes through a mesh with apertures of 2 millimetres ("mm")), from which a one-kilogram sub-sample was taken. The sub-sample was crushed to a grain size of 0.075mm and a 200 gram ("g") split was set aside for analysis. Stream sediment samples were wet-sieved through a 20 mesh (0.84mm) screen in the field and placed in cloth bags so that excess water could drain. The samples were transported from the field to Aurania's field office in Macas, Ecuador and batched for delivery to ALS's preparation lab in Quito for drying and screening at 80 mesh (0.18mm sieve aperture). 250g of the -80 mesh silt was pulverized to 85% passing 0.075mm, and was packaged by ALS for analysis. Aurania personnel inserted a certified standard pulp sample, alternating with a field blank, at approximate 20 sample intervals in all sample batches. Rock: approximately 0.25g of rock pulp underwent four-acid digestion and analysis for 48 elements by ICP-MS. The samples that had copper, lead and zinc grades of greater than 1%, and silver grades of over 100g/t underwent a second analysis in which 0.4 grams of pulp was digested in a mixture of four acids and the resulting liquid was diluted and analyzed by ICP-MS.
Apart from being analyzed by ICP-MS, gold was also analyzed by fire assay with an ICP-AES finish. ALS reported that the analyses had passed its internal QAQC tests. In addition, Aurania's analysis of results from its independent QAQC samples showed the batches reported on above, lie within acceptable limits. Aurania is a junior mineral exploration company engaged in the identification, evaluation, acquisition and exploration of mineral property interests, with a focus on precious metals and copper. Its flagship asset, The Lost Cities - Cutucu Project, is located in the Jurassic Metallogenic Belt in the eastern foothills of the Andes mountain range of southeastern Ecuador. This news release may contain forward-looking information that involves substantial known and unknown risks and uncertainties, most of which are beyond the control of Aurania. Forward-looking statements include estimates and statements that describe Aurania's future plans, objectives or goals, including words to the effect that Aurania or its management expects a stated condition or result to occur. Forward-looking statements may be identified by such terms as "believes", "anticipates", "expects", "estimates", "may", "could", "would", "will", or "plan". Since forward-looking statements are based on assumptions and address future events and conditions, by their very nature they involve inherent risks and uncertainties. Although these statements are based on information currently available to Aurania, Aurania provides no assurance that actual results will meet management's expectations. Risks, uncertainties and other factors involved with forward-looking information could cause actual events, results, performance, prospects and opportunities to differ materially from those expressed or implied by such forward-looking information. Forward looking information in this news release includes, but is not limited to, Aurania's objectives, goals or future plans, statements, exploration results, potential mineralization, the corporation's portfolio, treasury, management team and enhanced capital markets profile, the estimation of mineral resources, exploration and mine development plans, timing of the commencement of operations and estimates of market conditions. Factors that could cause actual results to differ materially from such forward-looking information include, but are not limited to, failure to identify mineral resources, failure to convert estimated mineral resources to reserves, the inability to complete a feasibility study which recommends a production decision, the preliminary nature of metallurgical test results, delays in obtaining or failures to obtain required governmental, regulatory, environmental or other project approvals, political risks, inability to fulfill the duty to accommodate indigenous peoples, uncertainties relating to the availability and costs of financing needed in the future, changes in equity markets, inflation, changes in exchange rates, fluctuations in commodity prices, delays in the development of projects, capital and operating costs varying significantly from estimates and the other risks involved in the mineral exploration and development industry, and those risks set out in Aurania's public documents filed on SEDAR. Although Aurania believes that the assumptions and factors used in preparing the forward-looking information in this news release are reasonable, undue reliance should not be placed on such information, which only applies as of the date of this news release, and no assurance can be given that such events will occur in the disclosed time frames or at all. Aurania disclaims any intention or obligation to update or revise any forward-looking information, whether as a result of new information, future events or otherwise, other than as required by law.